Jessica grew up in the small town of Blanding, UT. She moved to Utah Valley to attend school - BYU and UVU - and graduated with a bachelor's degree in English. She is working at her dream job of being a book editor at a publishing company. She hopes to one day fulfill her other dreams of being a writer and being a mother. Jessica and her cave-dweller husband, Tyler, currently live in Lehi, Utah, near the Jordan River. Chase Jensen graduated with a Bachelors of Fine Art in Illustration from Brigham Young University. Painting is his passion and he loves to create characters because it allows him to tell a story through something that has been influenced by his experiences. Unfortunately I ordered this book then received an email that it is no longer in print. We website is incorrect, it is not back-ordered it is out of print. So sad. This is directed at an L.D.S. audience but would be good for other Christians as well. Within these pages are beautifully illustrated pictures by Chase Jensen, which will certainly capture each young child's interest. The simply, rhymed sentences teaches the young child what the partaking of the Sacrament means and why we each should be very reverent. It suggests what actions are acceptable and not acceptable during this special time at church. It explains deeper meaning of the sacrament than most children's book cover on this topic, yet in a very simple and picturesque manner. I love this cute children's book! 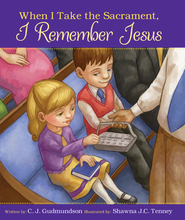 The pictures are adorable and the text is perfect for teaching kids why we have the sacrament and about how we should act during the sacrament. I loved reading this book to our almost 3 year-old and I loved the way his was engaged by the pictures and the rhyming words. This would make a great basis for a Family Home Evening lesson with young kids. This is a fun book to read to your kids and to be able to teach them about our most important time of the week! My daughters and I love this great LDS children's book with a meaningful message and dynamic illustrations to portray it. I just taught a lesson on the sacrament in my senior Primary class and it focused on helping the kids understand the power of the sacrament and how they can receive blessings from it. The Sacrament Is for Me is a great resource for younger children to understand this symbolic ordinance and how following Jesus brings happiness. Highly recommend!